Upon opening my emails this morning, I was surprised to read Jon Tevlin’s column “Transgender life is a long haul for Minneapolis woman ”about CeCe McDonald in the Star Tribune, acknowledging the trans rights activist’s persistent struggles to secure her livelihood and the ongoing harassment, discrimination, and violence many marginalized trans people, especially those of color, continue to endure – and all that despite the recent media spectacle around former Olympian and Keeping Up with the Kardashians’ favorite Reality TV dad, Bruce Jenner’s transition to Caitlyn. Tevlin rightfully recognizes Jenner’s trans visibility as one that is inherently privileged, wealthy, able-bodied and white: Jenner has unrestricted access to health care, housing, employment, and a secured income – resources that are unattainable for many trans people like McDonald: “There’s no comparison between Caitlyn and me except that we’re trans. She has a bodyguard. She doesn’t have to worry if her medicine will get cut off or if she’ll lose her food stamps. I don’t think she would have had any effect on my prosecution at all” (quoted in Tevlin’s column). And the sad truth is that McDonald is right. 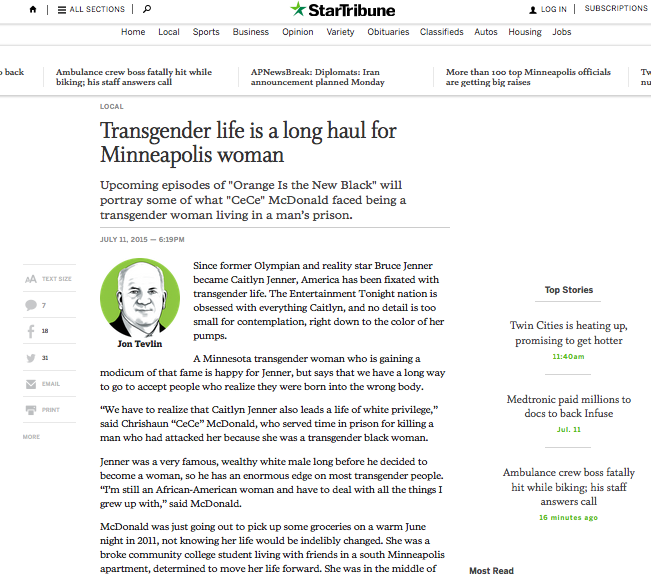 Now, the column’s “benign tone” itself admittedly surprised me because during its reporting on McDonald’s trial in 2011 and 2012, the Star Tribune’s coverage was outrageously insulting and demeaning, refusing to acknowledge McDonald’s transgender subjectivity. In one of my dissertation chapters, I illustrate in more depth how the Star Tribune and other local media outlets actively corroborated with violent state institutions in prosecuting McDonald. Local news organizations’ framing of McDonald’s racialized gender-nonconformity as violent and threatening colluded with the state’s refusal to grant McDonald a right to self-defense. In this mutual process, the media as an ideological state apparatus to use Althusser’s terminology worked hand-in-hand with repressive state institutions to reinforce discourses of the justice system’s alleged color and gender blindness, which strategically masked the state’s ongoing investment in and protection of whiteness under the guise of multiculturalism and enabled the multidimensional violence enacted against McDonald. Below are a few brief examples from the Tribune’s sensationalistic and derogatory coverage of McDonald’s case. The Minneapolis Star Tribune, which is the largest newspaper covering the Minneapolis-St. Paul metropolitan area, continued to misgender McDonald well after her self-identification as a trans woman was known and consistently framed her as a murderer. Articles frequently referred to McDonald by her birth name and described her as “Chrishaun Reed ‘CeCe’ McDonald, 23, who is a person in transition from a man to a woman” or as “McDonald, who is transgender and lives as a woman.” By consistently mis-gendering her, the Tribune belittled McDonald’s gender identity, denied her transgender subjectivity, and her right to self-determination. These news reports violently upheld discourses of a fixed, normative gender binary. While headline after headline repeatedly fetishized McDonald’s trans identity, it refused to discuss how her trans identity in relation to her identity as a poor woman of color affected the circumstances of the case. The local media failed to recognize McDonald as an intersectional subject and concurrently obstructed the materiality and structural inequality that she was facing by reasserting cis-gender identity and the gender binary as the norm. While the Star Tribune reported that “McDonald and a witness said Schmitz incited a melee after midnight when he made racist and gay-bashing remarks toward McDonald, who is black,” the paper’s succeeding articles were quick to label and criminalize McDonald as “a transgender murder suspect” whose alleged “pent-up fury exploded” from the “pressures of being transgendered.” The Tribune’s fetishizing of McDonald’s gender-nonconformity not only sought to render her deviant, but like other local news outlets, the newspaper deliberately reinforced a representation of McDonald as threatening and violent precisely because she was transgender. Invoking deep-rooted tropes of black rage and criminality, the local media coverage of McDonald’s case repeatedly suggested that the “pressures” of being transgender inevitably result in violence. These portrayals of McDonald as dangerous and violent, therefore, invalidated her claims to self-defense. How could the media have spoken differently about McDonald’s gender-nonconformity? Would it have made a difference if the Star Tribune and other outlets would have not constantly reminded readers through fetishizing and insulting phrases about McDonald’s anatomy, for example, by simply stating that she was “identifying as a woman”? Undoubtedly, local media reporters could have consulted with LGBT organizations, for example, GLAAD’s Media Reference Guide on transgender issues, or made an effort to follow the advice from local community organizers in how to properly refer to McDonald. Although it may appear admirable that the Star Tribune recognized the flaws and demeaning language it used in covering CeCe McDonald three years ago, it is important to consider the actual effects on improving the media representation of trans people through the institution of an official transgender style guide. I do not want to dismiss the importance of minimizing the media sensationalism around trans people and raising awareness about using an individual’s preferred pronouns and/or gender-neutral language; however, to simply be content with the media using the right pronouns to address someone appropriately makes it all too easy to overlook how the media continue to reinforce state institutions’ Othering of trans people, particularly trans women of color, by actively participating in dehumanizing and violating them and by sanctioning the state’s violence enacted against them. The use of style guidelines does not solve the fact that visibility for trans people still carries mostly negative implications and that despite a proper acknowledgement of a trans person’s gender identity this visibility does not lead to justice. The ad incited an outcry among local LGBT groups and advocates. Steve Yaeger, the Star Tribune’s vice president of marketing and public relations, however, asserted, “The ad in question met all the requirements of our ad policy” (See Joe Strupp, “Misleading Anti-Transgender Newspaper Ads Spark Outrage in Minnesota,” Media Matters). The Star Tribune’s treatment of trans people exemplifies that the promise of visibility as a crucial element in alleged progress narratives about securing citizenship rights for LGBT individuals may not necessarily lead to “the promised land” and outweigh its perils.